Have you tried Reverse Shampoo? If you want to improve the efficiency of your hair products without adding time to your beauty routine, the concept of Reverse Shampoo might well interest you! The concept is really simple: “Reverse Shampoo” consists in washing your hair in reverse. All you need is to use your conditioner before your shampoo. This technique aims at cleaning your hair without creating damages. It is particularly useful for people with thin and/or breakable hair. It can also help you to get rid-off the evil oily roots/ dry tips combo. You don’t need any specific products, just use your regular conditioner and shampoo. This technique will also improve their efficiency. How to correctly do a Reverse Shampoo cleaning? Wet your hair and make sure it is really saturated with water. It is important because it will help you applying your conditioner homogeneously. Apply your conditioner and leave it the same amount of time that you usually do. You might think that it is time to rinse but do not rinse! Just apply your shampoo and use it to remove your conditioner. Lather and rinse. 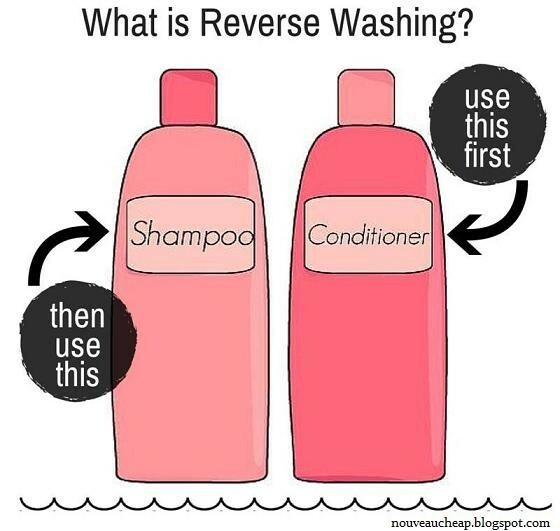 Why does Reverse Shampoo works? Thanks to reverse shampoo your hair can make the most of your conditioner as you can apply it from roots to ends without being worried of oily hair. Indeed the shampoo will remove the surplus of conditioner that your hair didn’t absorb. You might be able to space your shampoos and stop washing your hair everyday as your hairdresser told you hundred times. Thanks to this simple tip your hair might gain volume and look fuller so don’t hesitate anymore and change your shampoo for your conditioner next time!